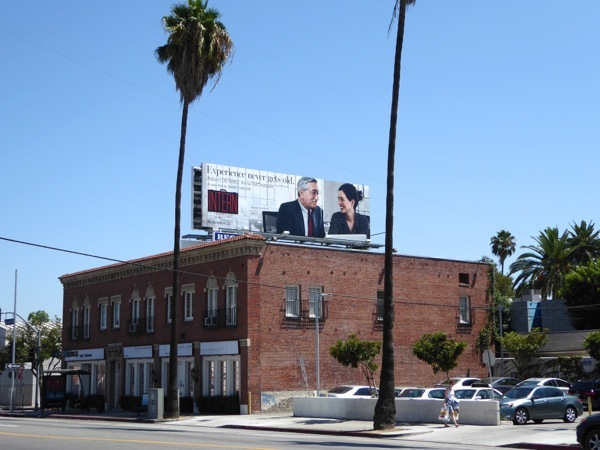 Daily Billboard always tries to see the positive in any ad creative, especially knowing that a lot of time, effort and hard work have usually gone into the final product. 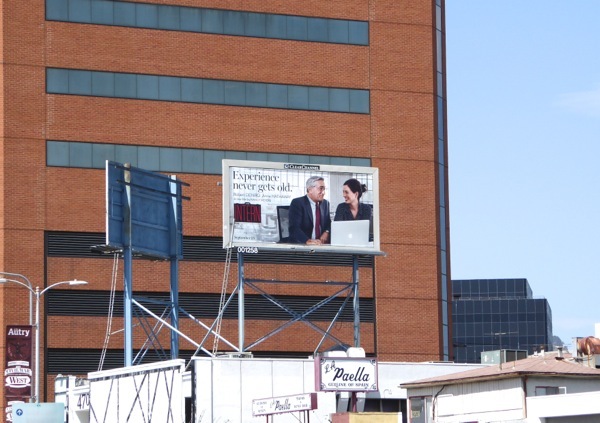 However, sometimes a billboard will stand out for all the wrong reasons. 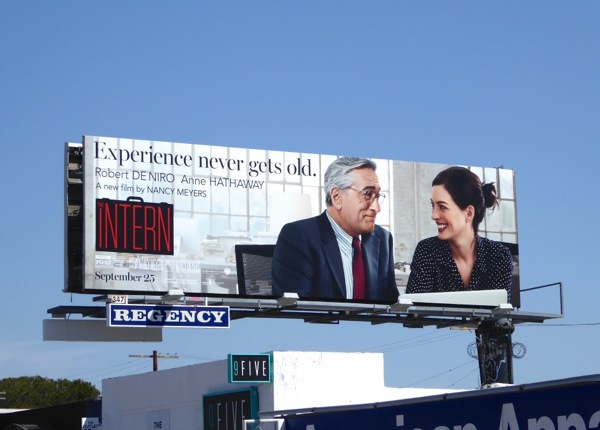 Case in point, these outdoor ads for the new workplace comedy starring Robert De Niro and Anne Hathaway, The Intern. 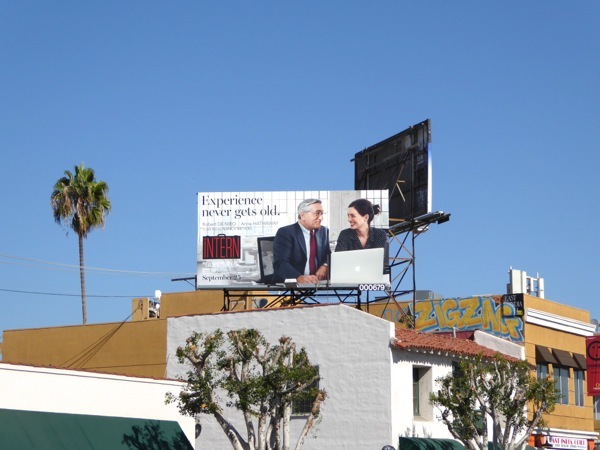 The instant we saw them the first thing that came to mind was some educational PSA to help get senior citizens back in the work place, or show them how to use the internet (and Daily Billboard isn't the only ones to think it, as other people have made the observation unprompted). 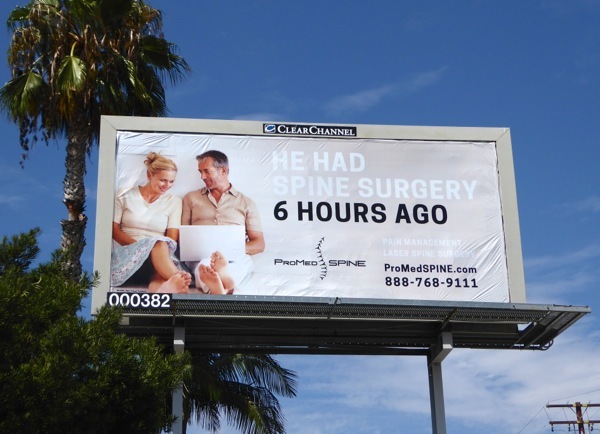 It's not helped by the fact there are similar ad creatives filling L.A.'s skies at the moment about back surgery (on occasion a stone's throw from the movie billboards), utilizing a similar lifestyle approach, which ages the overall campaign. Meanwhile the other portrait ad creative for the film by Nancy Meyers looks like it's just stepped out of a fashion editorial (which actually fits better with the movie's premise). 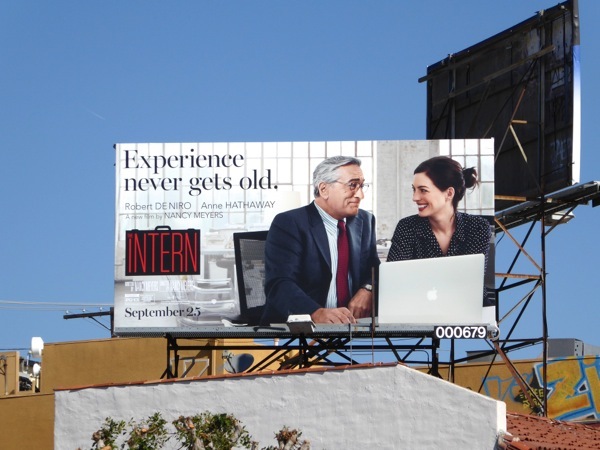 But maybe the older demographic is what the client was aiming for, as De Niro plays a 70-year-old widower bored with retirement and offered an opportunity to get back in the workplace as an intern at a Hathaway's online fashion website, where she discovers his charm and experience are a far cry from some of her other younger employees and colleagues. 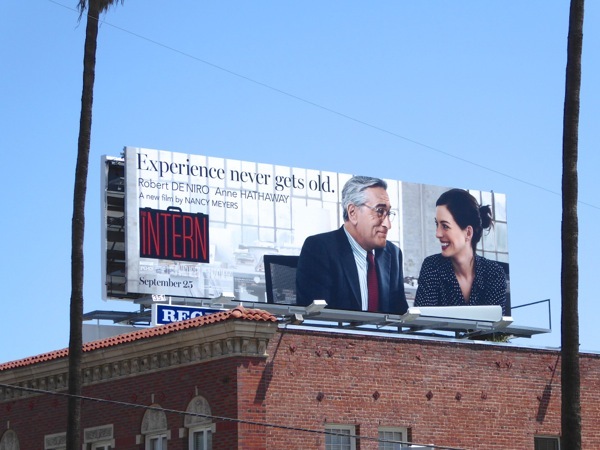 These billboards for The Intern was first spotted along the Sunset Strip on August 20, then later further east along Sunset Boulevard, plus snapped along Melrose Avenue, Wilshire Boulevard, La Brea Avenue and San Vicente Boulevard through September 6, 2015. 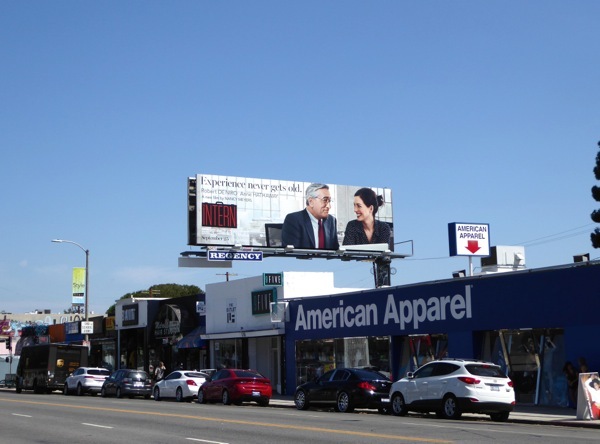 If you're an admirer of Anne Hathaway, be sure to check her out in these Les Misérables movie billboards, and if you're a fan of the legendary Robert De Niro you can also enjoy these Last Vegas movie billboards, these Grudge Match film billboards and this billboard for The Family. 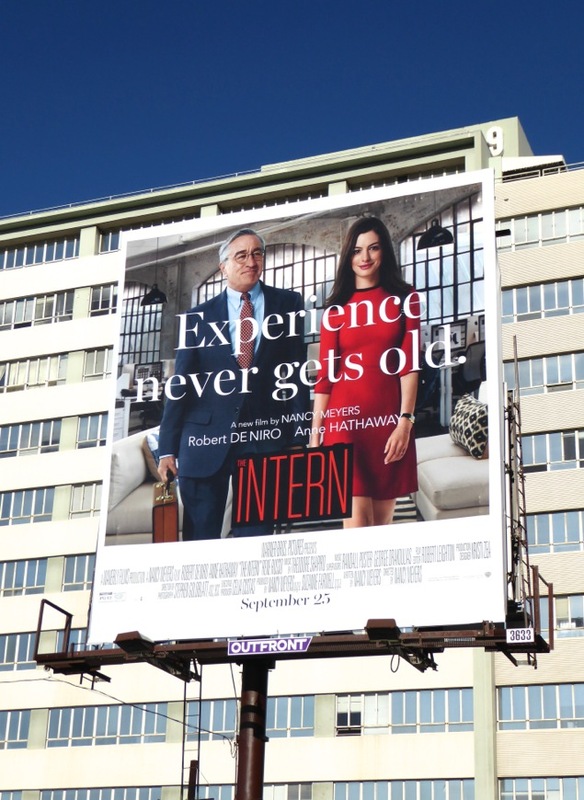 Let's hope this new generational comedy proves to be funnier and more of a box office success than Vince Vaughn and Owen Wilson's similarly titled The Internship from June 2013. 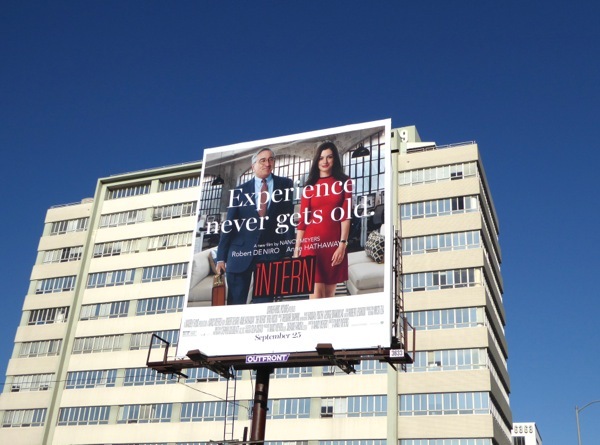 Yes, 'experience never gets old', but some billboard campaigns don't always age well either.